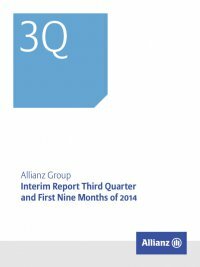 Interim Report Third Quarter and First Nine Months of 2014 Allianz Group10 Risk management Risk management is an integral part of our business and supports our value-based management. For further information, please refer to the Risk and Opportunity Report in our Annual Report 2013. The ­Allianz Group’s management feels comfortable with the Group’s overall risk profile and has confidence in the effectiveness of its risk management framework to meet the challenges of a rapidly changing environment as well as day-to-day business needs. The risk profile described in the latest Risk and Opportunity Report in general remained unchanged. While the European sovereign debt crisis has receded, we con- sider the current state of the economy, combined with the persisting low interest rate environment in the Eurozone, as a rising risk for achieving our investment targets. The significant increase in geo­ political uncertainties during the current year as well as the potential spread of Ebola also represent risks which we are monitoring closely. In addition, ­Allianz continues to be exposed to regulatory develop- ments – especially the European solvency directive, Solvency II, and the designation of ­Allianz as a global systemically important insurer. This may affect our business environment and would not normally be associated with our core operating activities. Financial market and operating environment developments Many countries within the Eurozone are currently faced with a sput- tering economy and lower inflation rates addressed by the European Central Bank with its accommodative monetary policy. As a result, financial markets are facing an environment with historically low interest rates and lower risk premia – with investors looking for risk- ier alternatives to highly rated fixed income investments. The recent weakening in the Eurozone’s growth momentum, the implementa- tion risk of long-term structural reforms in key Eurozone countries and the uncertainty about the future path of U.S. monetary policy may lead to higher market volatility accompanied by a flight to ­quality. The recent increase in geopolitical risks, as well as those result- ing from U.S./E.U. sanctions against Russia during the third quarter, are manageable for the ­Allianz Group since our direct investment exposure to this region remains relatively small in the context of our overall investment portfolio. Nevertheless, we are monitoring these developments closely since a significant deterioration may lead to spillover effects on global markets, which could have a negative impact on our business and risk profile. The further spread of Ebola also represents an indirect risk, with its impact on the global economy and trade in an extreme scenario. Over the past years ­Allianz SE and its operating entities have developed operational contingency plans for various crisis scenarios and have continued to conduct scenario analyses on a regular basis to bolster our financial and operational resilience to strong shock scenarios. In addition, we aim to further improve our product design and pricing in the Life/Health business segment with respect to guar- antees and surrender conditions. Continuous monitoring as well as prudent risk positions remain priorities for our management. Regulatory developments In July 2013, the Financial Stability Board designated ­Allianz as one of nine G-SII firms (Global Systemically Important Insurers). In Novem- ber 2013, the European Trialogue process involving the Council of the European Union, the European Commission and the European Par- liament came to an agreement on the Solvency II “Omnibus II” direc- tive, allowing the new risk-based solvency capital framework for the E.U. to proceed with a planned introduction date of January 2016. This was approved by the European Parliament in March 2014. Although the Commission’s draft for the delegated regulation of Sol- vency II was published in October 2014, the final approval is outstand- ing and technical standards as well as guidelines for further clarifica- tions are still expected. Since the deadline for the formal application of our internal model for Solvency II is approaching, this situation creates uncer- tainties for our approval process, especially if the final rules deviate from the current ones. The remaining uncertainty of future regula- tory requirements (Solvency II as well as those applying for G-SIIs) also create uncertainty in terms of ultimate capital requirements for ­Allianz. In addition, due to the market value balance sheet approach, the Solvency II regime will lead to higher volatility in regulatory capital requirements compared to Solvency I. Finally, the potential for a mul- tiplicity of different regulatory regimes, capital standards and report- ing requirements will increase operational costs.